Welcome to my restoration pages for the 1969 Limited Edition 600 Mustang Sportsroof. I will be updating these pages as I go though the restoration process. This is my second 1969 Mustang restoration project. You can see my first Mustang project and my other past restoration projects by going to the Garage Index. And so it begins again. I wasn't planning on doing another Mustang this quick since I have a real cool 1963 Jaguar XKE that is need of restoration, but I got my hands on this 1969 Limited Edition 600 Mustang Sportsroof, which I wanted to get done first. The Limited Edition 600 Mustang Sportsroof was produced as part of a special promotion in the Philadelphia area in the Spring of 1969. The latest information shows that 508 cars were produced for this promotion. 92 cars short of the 600 planned. The cars were available in either Flower Power Red (1969 Calypso Coral/ 1965 Poppy Red) or Groovy Green (1972 Bright Lime Green). They came in both coupe and fastback body styles. Most of which were 6 cylinder cars. Many of the coupes came with a black vinyl top. Each of the cars received a special Limited Edition 600 decal, which was located under the Mustang emblems on the front fenders. To learn more about this little known promotion visit the Limited Edition 600 Website by Donald Hughmanick. He has a real interesting ariel photo showing 180 of these cars. If you have a Limited Edition 600 Mustang, please register it at his site or drop me a line. I first learned of this promotion from a message that Don posted on the Vintage Mustang Forum in 2002. I visited his website and was suprised to learn something new about my favorite Mustang production year. I liked the Groovy Green color and imagined what my Dark Jade Sportsroof would look like in that color. Little did I know that over a year later I would own the Groovy Green Sportsroof that Don had listed in his registry. So how do you tell if a car is a Limited Edition 600 ? First the car had to have been built in the Metuchen, NJ plant, designated by a 'T'as the second character in the VIN. The dead give away is the lack of color code and a DSO number of 162783, 162784, 162785, 162786, 162787 or 162788 on the warranty tag located on the driver's door. Also if the car still has a buck tag, which should be located on the top right inner fender by the hood hinge, it should have either a code of WT5185 or MX8241928. Also, the first ones produced had VIN's in the range of 9T0##192400 - 9T0##196000 (## = any body style code and any engine code). If you have one for sale or know where there is one, please let me know (e-mail) since I am looking for a companion for this one. 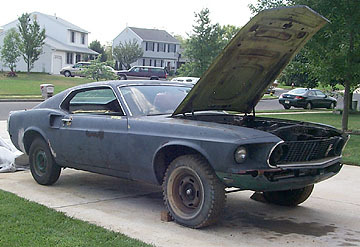 On July 30, 2003 I found the car listed in the 69/70 Mustangs For Sale section of the Vintage Mustang Forum. It had been listed for several months, so I wasn't expecting it to still be available. I contacted the seller, Edward Broomall of Clarksboro, New Jersey. I learned from Ed that he had rescued the car from a New Jersey salvage yard (Ritt Jones in Swedesboro), where quite a few parts were stripped from it over a two year period. Ed told me that he had originally hoped to restore it because of the unusual original color, but he changed his mind after acquiring a 1969 Mach I. He told me that several people were interested in it, but no one had actually put any money down on it. Not wasting any time, avoiding the dreaded "You Snooze, You Loose", I arranged to purchase the car for $1,200. Ed agreed to accept my $500 deposit via the mail and the rest of the payment when I came to get the car on August 28th (thanks Ed). Here are some pictures that Ed sent me that shows the interior (or what's left of it). Luckily I have a spare instrument cluster and passenger pod with courtesy light. Since the New Jersey state title that I got with car has an odometer reading, I'll set the milage on the new cluster to match. The car didn't come with a good dash pad, but even if it had one it would have been stripped from it when it was in the salvage yard. The door panels were missing, but they make high quality repos and they are pretty inexpensive since the car came with a standard interior. The headliner, carpets and seat covers are relatively inexpensive as well. From the pictures you can tell that the car originally came with an A/C system. This coincides with the 'AC' on the buck tag. By the time of this writing I had acquired almost every component that I needed for the A/C system. In these pictures you can see the hole in the lower section of the passenger's door for a stereo speaker. The car was originally equiped with an AM/FM stereo, which is not a very cheap item to replace. Though not evident at the time the stereo speaker holes coincide with the 'LP' on the car's buck tag. All of the rear interior trim was missing, minus the sail panels. Most of the pieces can be easily gotten, but the big rear trim panels can be a little pricey and hard to get without any cracks. I do not plan on buying them repo since the repos don't fit very well. The original paint can be seen in these pictures. Got to love that Groovy Green. Here is another picture that Ed sent me that shows the engine compartment. Just about everything was missing, except for the steering gear box and master cylinder. An examination of the engine yields that it is a 302 that was assembled on March 13,1973. Needless to say the engine is not original, though the left side inlet on the water pump easily gives that away. I will put the engine compartment back to its original appearance. This includes locating an original 1969 Ford 302 engine. UPDATE: 11/04/06 I purchased an original 69 Mustang 302 engine.